These savoury tarts are quick and easy to make (particularly if you’ve made the pastry cases in advance) and will be even more delicious when tomatoes come into season properly. To make the pastry, begin by cutting the butter into small cubes. Add to the flour and a pinch of salt in a mixing bowl. Blend by hand until the mixture becomes crumbly. Add the olive oil, blending well and then the cold water, mixing rapidly with a spoon. Remove the mixture from the bowl onto a lightly floured surface. Knead until you obtain a ball of pastry (if the mixture isn’t ‘sticky’ enough to form a ball, you may need a drop more water). Wrap in a clean cotton tea towel or some cling film and leave to ‘rest’ in the fridge for about two hours. This relaxes the dough and makes it easier to use. Preheat the oven to 180°C. Roll out the pastry on a clean, lightly floured surface and fill the tart tins. Bear in mind that buckwheat pastry is extremely crumbly as it contains no gluten to ‘stick’ it together. You’ll probably need to patch and press the pastry into the tins as opposed to just cutting and placing it in as you would with normal pastry. Precook the pastry for 10 minutes. Fill the tarts with the shallots, garlic and tomato slices, finishing up with a slice of goats cheese on top. Season and cook for about 15 minutes, or until the tomatoes are ‘mushy’ and the cheese has melted. This entry was posted in Gluten-free, Savoury and tagged buckwheat flour pastry, chairlifts, gluten-free pastry, goats cheese, skiing, tomato. Bookmark the permalink. These tarts look great. Very tasty and presumably the buckwheat is healthy too? Could you use spelt flour instead? Only that I bought lots in a recent burst of enthusiasm. Oh my, I am sorry to chuckle at your situation but the visual is just too funny! 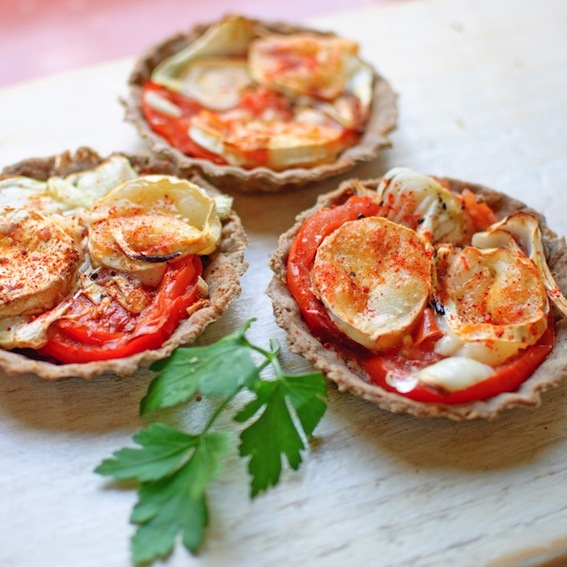 Your tarts are lovely, nothing better than tomato and goat cheese, simply delicious! These tarts look so delicious… and definitely healthy! I love buckwheat, I’ve started eating it for breakfast with yoghurt and fruit (and a touch of cinnamon!) but I’m yet to try the flour. Sorry to hear about the skiing mishap..! They are Paul. And thank you. funny visual (tortoise!) & super tempting food – it’s the kind of thing I like to eat but never make on my own!